To view 10 more pictures, interactive maps and the full, detailed description of the The Lakes at Poquoson community, please Login. 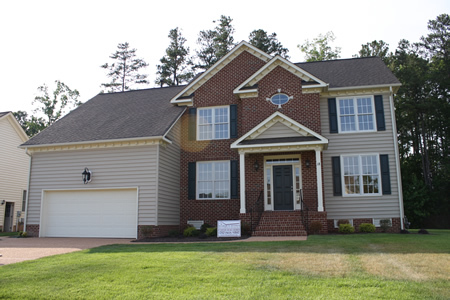 Looking at real estate for sale in The Lakes at Poquoson can lead to a new home. Land here is just as picturesque as the properties themselves making this an ideal setting. This fashionable community is tucked into a quiet section of Poquoson, VA. Residents get the benefits of living in a seemingly small town environment. They don’t lose quick access to city amenities and military bases such as Joint Base Langley-Eustis and Naval Weapons Station Yorktown. The Lakes at Poquoson consists of 44 home sites. The serene land is dotted with little lakes and pockets of woods to provide the perfect retreat. Builders here want each homebuyer to feel involved in the process so he gets every upscale feature desired in his new home. The real estate for sale here has three models to choose from. Each home here may include foundation with crawl space, brick steps complete with iron rails, treated deck, two gas fireplaces with marble surrounds, tray ceilings, dual-zone heating and cooling system, brick exterior front, hardwood flooring, granite countertops, sprinkler system, Andersen windows and much more. Residents can keep trim on walking trails that are just steps away. This particular region of Virginia boasts good schools and low crime rates, so it’s already ahead of several parts of Hampton Roads. The small town charm never seems to wear off of this town and the reason for that is the friendly people. New home owners need not worry because there is plenty to do within close driving distance. The Lakes at Poquoson is not far from a city museum. Tour the Poquoson Museum and learn about how the people have shaped this land into what it is today. Searching for the right real estate for sale can be taxing so unwind at the Langley Speedway. Or take a relaxing horseback ride through the countryside at Yorktown Stables. Those looking for a better way can drive through this neighborhood to catch a glimpse of what life can be like. Admire the real estate for sale, the land, the scenery and know this could be part of everyday living. The Lakes at Poquoson could be the location of your new home- so come join the fun! Send me more information about the The Lakes at Poquoson new home community. Our agents gladly offer FREE property tours of The Lakes at Poquoson, Poquoson and homebuyer consultations to all serious buyers.